The Ford Mustang GT350 lost its Mustang tag and was marketed simply as the Shelby GT350 for the 1966 production year. Ford struck a deal with the car rental company, Hertz Corporation, to offer about 1,000 GT350s for rental and afterwards these cars were returned to Ford, refurbished, and sold to the public as GT350-H models. 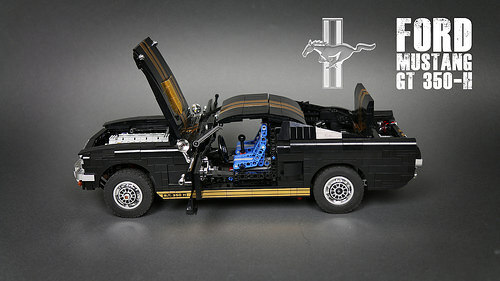 Most ex-Hertz cars were black with gold Le Mans stripes and rocker panel stripes, just like this phenomenal LEGO version built by Paweł Kmieć. 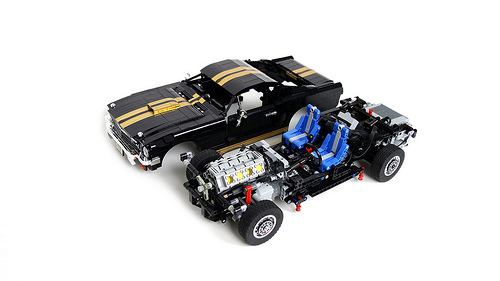 If we take a peek under the chassis, you will see another aspect of this LEGO Ford Mustang GT 350-H. Oh yeah, that’s a Power Functions battery pack in there, along with two PF L motors for power, and one Servo motor for steering! 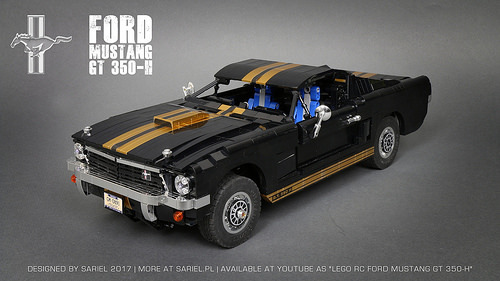 The builder made this great video to explain many more of the design features he included in the vehicle, and shows off his muscle car in full, remote-controlled action.